cooking in a kitchen that's the size of a shoebox. 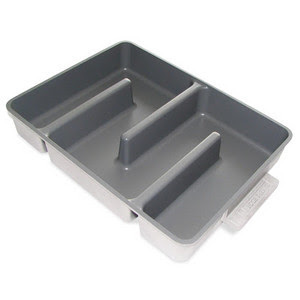 I've been thinking about getting one of these pans for a while. I resisted, thinking I don't NEED another baking accessory. I have plenty of adequate pans to bake brownies in. 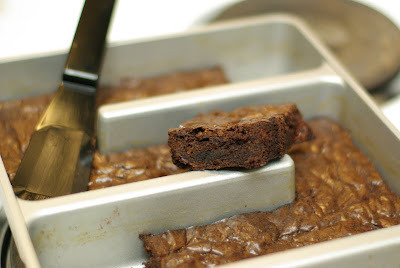 But I'm one of those people who absolutely love the crusty, chewy brownie corners fresh from the oven. So when I saw that this pan was available on Think Geek for Geek Points (and I had enough points saved up!) I had to get it. I waited patiently for its arrival. I occupied my time thinking about what goodies (besides brownies) to bake in this pan. And then the pan arrived! The pan is much sturdier than I expected, and came with a small spatula. I actually overbaked them a bit. The directions that came with the pan say that baking time doesn't need to be adjusted for this pan. But doesn't that depend on the recipe yield? Not all brownie recipes yield the same amount of brownie. But I wasn't disappointed. The brownies came out delicious. And every brownie had a chewy, crusty edge on it. Brownie-making tip: Add a packet of instant Starbucks Via to the brownie batter. Coffee always enhances the flavor of chocolate, and the Via packets make it super easy to do just that. Yet another taste of summer. 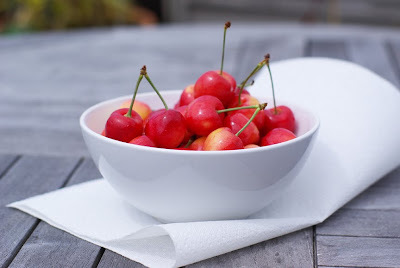 White nectarines have a milder and sweeter flavor than yellow nectarines; and I love sugary, juicy, really ripe fruit. 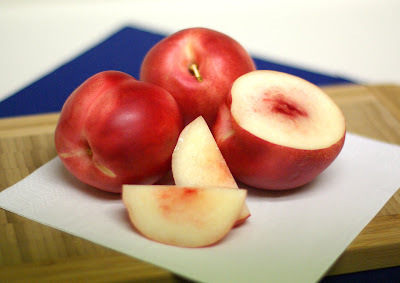 These white nectarines taste like peachy honey. Look for them at the local market mid-July through August. They tend to be a bit pricier than their yellow counterparts, but they're totally worth it. When avocados go on sale, I can't resist buying a few. When perfectly ripe, I love their soft, buttery flavor and velvety texture. They're also a superfood, high in various nutrients that are good for the body, and high in monounsaturated fats, which helps to lower bad cholesterol. Of course, the nutrition changes when the avocados are mashed into guacamole and then eaten with countless fried corn tortilla chips...but that's beside the point. 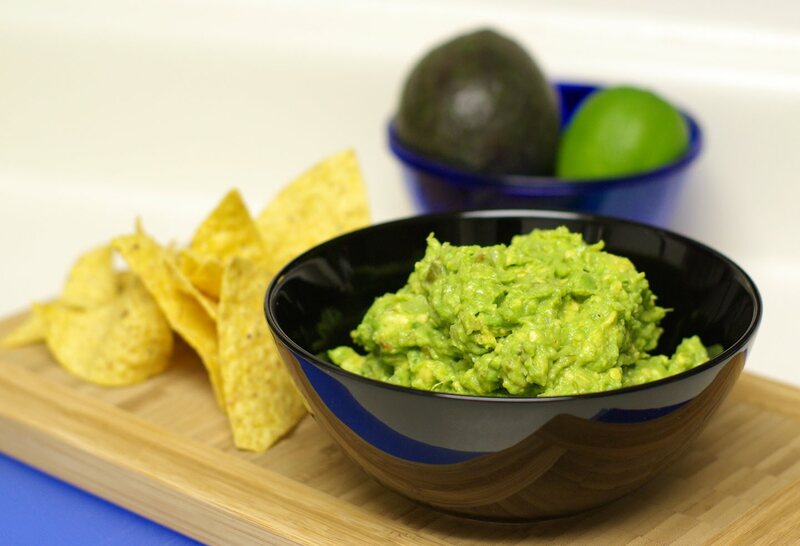 The point is, avocados are yummy, and my favorite way to gobble it up is in guacamole. I don't follow a recipe for it. It's one of those dips that can be totally adjusted to suit your taste. 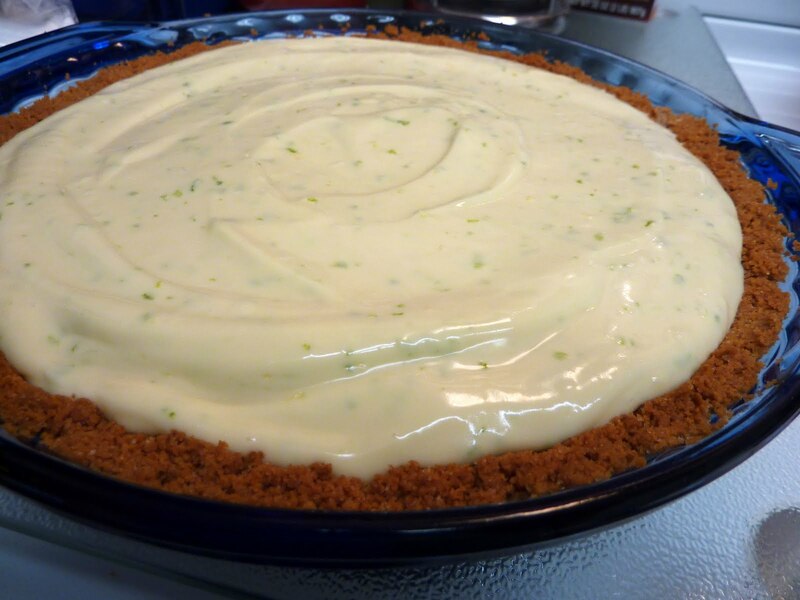 For me, the essential ingredients always include a large avocado (obviously), a bit of minced onion, a couple cloves of minced garlic, one or two seeded jalapenos, and lots of lime juice. If I have cilantro on hand, I'll toss in some of that. Some people add diced tomatoes, but I feel like they muck up the pretty green color of the avocados. Mash all the ingredients in a bowl with a fork, and devour with the aforementioned tortilla chips! If I'm not making guac, I also love avocados diced up and tossed in salads, or as a garnish on tortilla soup. Or just eaten plain, maybe with a sprinkle of Bacon Salt. Mmmm. How do you eat your avocados? 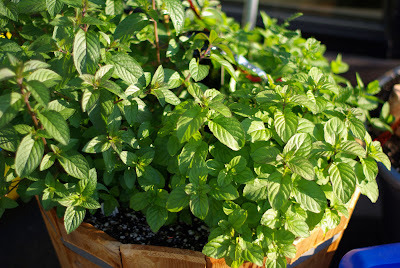 I've been waiting for the mint in the garden to grow for some time now. Yay! There's plenty to make mojitos (and then some), my favorite summertime beverage for lounging around on the rooftop deck. 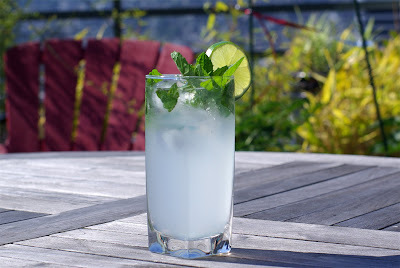 On a hot, sunny day, there's nothing like a little lime, sugar and mint all muddled together in a glass full of ice and club soda (granted, hot sunny days are pretty few and far between here in Seattle, but I'll take what we get) . Now what do I do with the rest of that mint? Okay, so this isn't really food, but it sort of resembles it. Sort of. 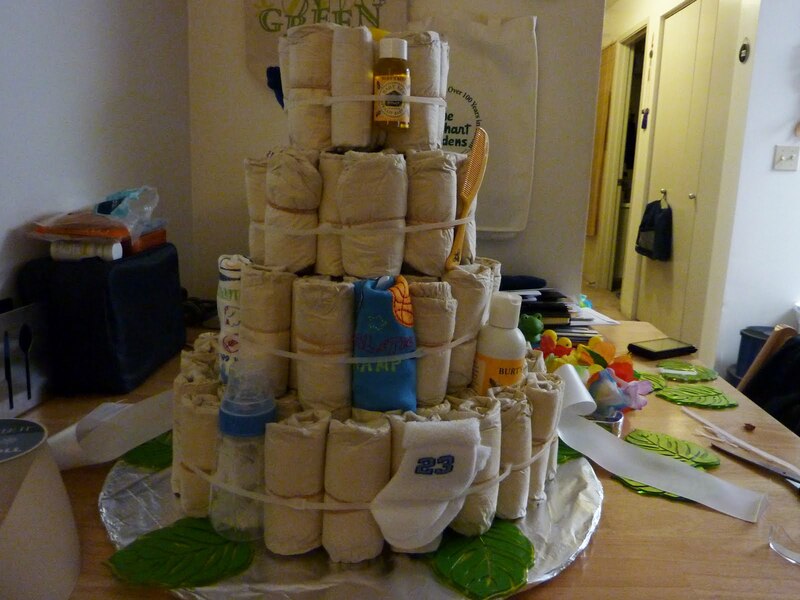 I broke out my crafty-hat a few months ago and made a diaper cake for a friend's baby shower. I'd never made one before, but I've seen lots of pictures and figured it couldn't be that hard. It wasn't! It was just a little time-consuming, but totally worth it because it was totally fun to make. It was a hawaiian-themed baby shower, so I decorated the "cake" to look tropical. I found silk hibiscus flowers and palm leaf-shaped coasters to decorate. And since I knew in advance that the baby is going to be a boy, I found cute blue polka-dotted ribbon to surround each tier of the "cake." 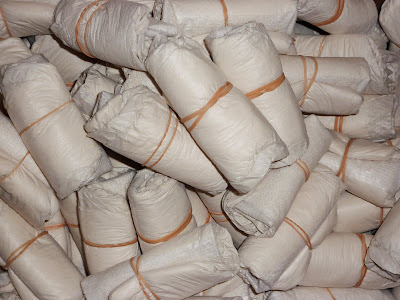 Here's how it began: I used all-natural unbleached Seventh Generation size 1 diapers. I rolled each one and secured them with rubberbands. I lost count of how many I used total, but I think it's somewhere in the neighborhood of 120. For the core, I found a fun, colorful rainstick that I'm sure will become a useful toy (a distraction, perhaps) for the baby. 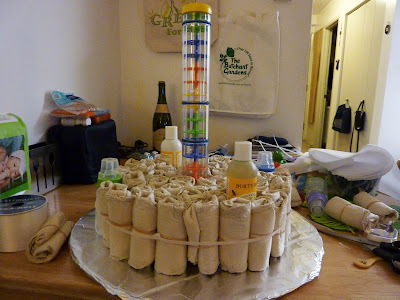 first tier of the "cake"
I used cable ties to secure all the diapers together. 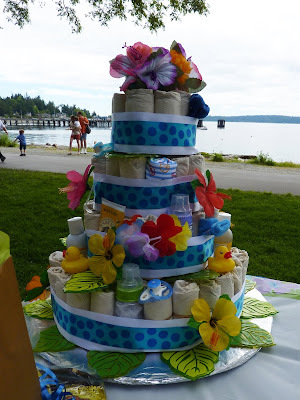 The use of sticky tape isn't an option for a diaper cake since the goal is for the parents to take this apart and be able to use the diapers (which will be much needed, I'm sure). 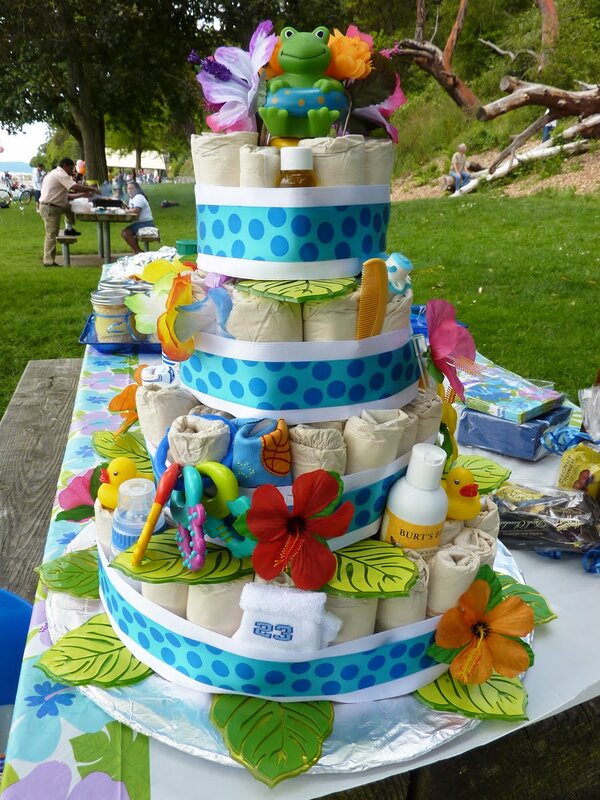 I also randomly place Burt's Bees baby products, small toys, bibs and socks throughout the "cake" to add visual interest (and of course for the parents to use for their baby). The toy rainstick core was crucial in holding all the "cake" tiers together. I managed to travel with this "cake" and get it to its destination intact. It was so fun to make and show off, and the expression of delight on the mother-to-be's face when she saw it made the work all the more rewarding for me. I hope to get the chance to make more diaper "cakes" in the near future! Hear that, friends? Breed on! P.S. Congrats to the new mother, who, by the way, delivered a healthy baby boy on August 5, 2010. Welcome to the world, baby Jackson! I was on a quest for a good poultry marinade. Something with bold flavor that would stand up to the grill. And I found it! This is Emeril's Essence. You can buy the stuff premade in the spice section of the grocery store, but it's just as easy to make at home. 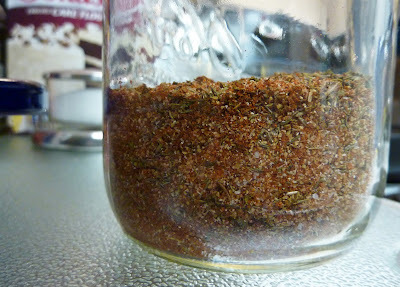 The ingredients consist of spices and dried herbs that I typically keep stocked in my spice drawer anyway. For the marinade, I use some of this mixture combined with equal parts fresh lemon juice and olive oil, and some chopped fresh rosemary. 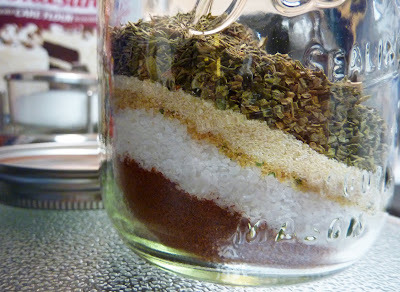 This is the perfect marinade for boneless skinless chicken thighs and/or breasts. After a couple hours in the marinade, the chicken's ready to toss onto the grill. It's perfect served with a side salad of greens or pasta, or couscous. Or grilled potatoes. Maybe a rice pilaf. Grilled veggie skewers...oh, the possibilities! It's another taste of summer. 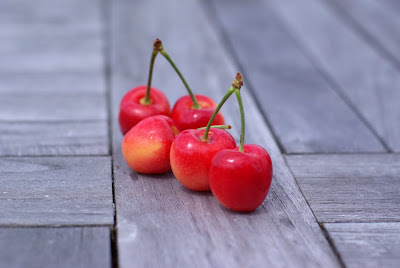 It's also the first time I've tasted this variety of cherry: the Orondo Ruby. In my taste opinion, these Orondos taste something like a Bing and a Ranier variety mixed together. Most importantly, they're juicy and yummy. If you can find them, try them. I recently found limes on sale at the local market. They were abundantly-sized, too. And speaking of abundance, they were 5-for-a-dollar. That's a steal in my neck of the woods, so naturally I bought 15 of them. And as much as I'd like to think I can drink that many mojitos, I opted to put these limes to another use. Technically, the recipe is called Icebox Key Lime Pie, but I didn't actually use key limes. 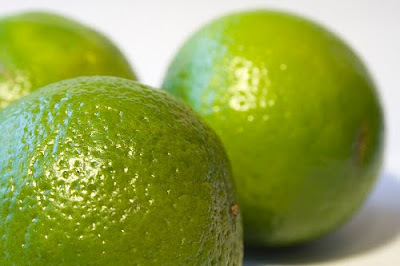 America's Test Kitchen states the taste tester's reviews between real key limes and the more common Persian variety were mixed, and therefore interchangeable. Thanks for the knowledge, ATK! 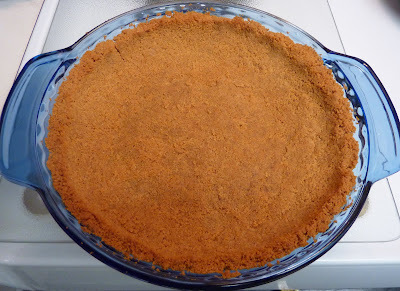 Off to make a fresh, buttery graham cracker crust. The filling recipe comes from Cook's Country, which is part of the ATK family of websites. ATK offers a wealth of kitchen knowledge, including equipment reviews and taste tests. Can you tell I'm a fan? A subscription is worth it. Then it goes in the fridge and my patience gets tried. After that trying period, my patience is rewarded! 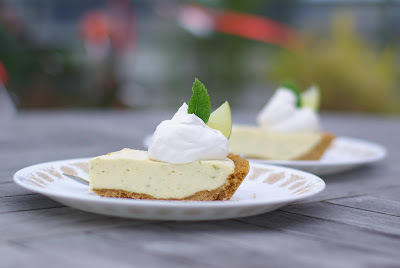 A little garnish of some freshly whipped cream, mint, and lime, and it's a perfect day on the deck with a summery desert. And just so you know, the recipe didn't actually call for all 15 limes, so I still had a few leftover for plenty of mojitos. Summer is upon us, and that means it's grillin' time. And gardenin' time, too! 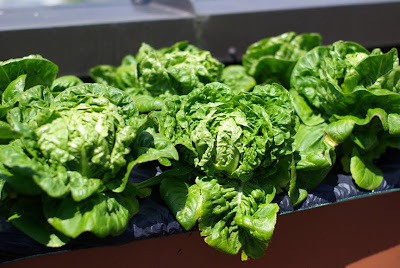 That's baby romaine ready to harvest. Once harvested, it's my turn to take over. 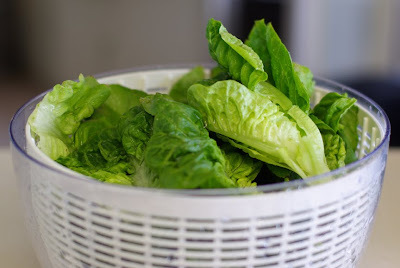 I make sure to wash the leaves thoroughly and then take them for a spin in the OXO salad spinner (love that thing!). And this is the start to a delicious summer meal. 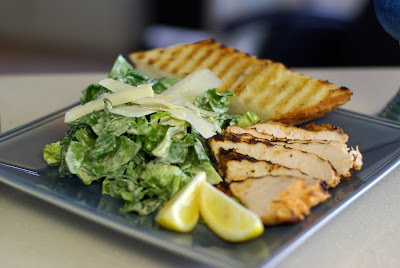 I marinated boneless skinless chicken breasts in a fresh lemon and rosemary (also from the garden) marinade for a couple of hours and threw them on the grill, along with some buttery garlic bread. To dress the salad, I made a creamy Caesar dressing, tossed it with the newly-grown leaves, and adorned it with some real parmigiano reggiano (there's no substitute). Ta-da! A yummy, classic but elegant, dinner in a flash. I'm looking forward to cooking up (or devouring raw) the other produce growing in the garden: various tomato varieties, including yellow and heirloom; other lettuce varieties, including endive; carrots; celery; leeks; broccoli; edamame; zucchini, any culinary herb you could possibly think of, and the list goes on. Thanks for having the green thumb, BF, and here's to a bountiful summer!